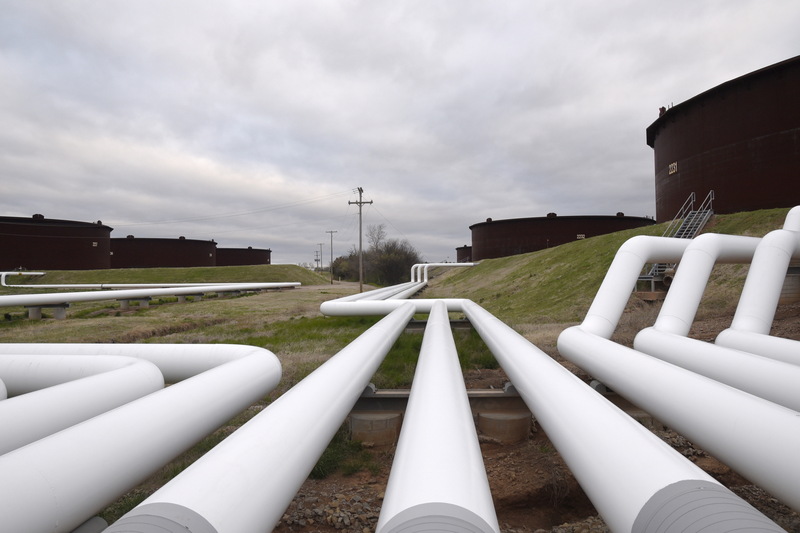 Pipelines run to Enbridge Inc.'s crude oil storage tanks at their tank farm in Cushing, Oklahoma, March 24, 2016. Picture taken March 24, 2016. Chesapeake Energy reported $309 million of earnings attributable to common shareholders for the fourth quarter of 2017, beating analysts’ estimates as production rose and costs fell. That compared with a loss of $740 million a year earlier. Excluding special items, Chesapeake earned 30 cents per share, beating analyst estimates of 24 cents per share, according to Thomson Reuters I/B/E/S. The company said in its statement on Feb. 22 that production rose to roughly 593,200 barrels of oil equivalent per day, 3.3 percent above the same quarter last year. Adjusted for asset sales, production rose 15 percent. The company’s shares were up 17 percent to $3.09 a share on Feb. 22 at 1010 EST.